It's Just Mobolaji | Music & Entertainment: Chad Ochocino Tattoos Evelyn Lozada's Face on HIS LEG? 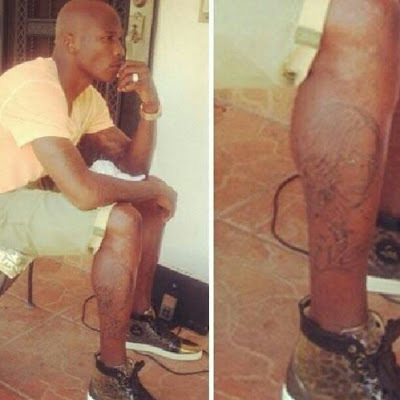 Chad Ochocino Tattoos Evelyn Lozada's Face on HIS LEG? Now I don't know if this idea as stupid or smart Chad... But you are known for making stupid decisions... SOMETIMES! After the incident of Chad Ochocinco Johnson headbutting wife, Evelyn Lozada - both Chad and Evelyn have been laying low. Especially Evelyn as her brother-in-law died. Evelyn also decided to file for divorce, but Chad doesn't seem to care about that with this new tattoo and with these tweets! I dont give a flying pretzel in skittle rainbow hell what she filed for... RT @cchx3reh: I thought she filed for divorce tho? Should Evelyn take Chad back? Or will she?